You are here: Home / News / You Do Know, Fake News Has Real Consequences. You Do Know, Fake News Has Real Consequences. 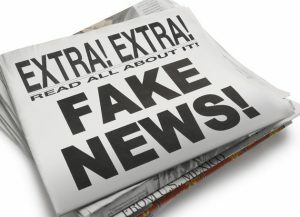 (ThyBlackMan.com) The mainstream media continue to embarrass themselves and mislead the American people in their relentless pursuit of negative stories about President Trump. For the past two years, mainstream media outlets have relentlessly attacked the President and his policies, publishing false and uncorroborated reports that call into question the existence of journalistic ethics in America. The latest example of this malpractice is the recent BuzzFeed News report alleging that President Trump told his former attorney, Michael Cohen, to lie to Congress about a construction project in Moscow. BuzzFeed based its article on two anonymous law enforcement officials who allegedly referenced Cohen’s statements to Special Counsel Robert Mueller, claiming the statements were backed up by emails, text messages, and other documents. The article failed to directly source or substantiate its explosive allegations — and now we know why. In an unprecedented act, Mueller’s office issued a rare statement disputing the accuracy of the story. “BuzzFeed’s description of specific statements to the special counsel’s office, and characterization of documents and testimony obtained by this office, regarding Michael Cohen’s congressional testimony are not accurate,” a Mueller spokesperson said. Sadly, journalistic malpractice doesn’t just harm the mainstream media. Fake news has the power to shape national political discourse, leading to very real consequences outside of the media bubble. Following BuzzFeed’s report, Democrat lawmakers lined up to smear President Trump, accusing him of obstructing justice and calling for his impeachment or resignation. “If the Buzzfeed story is true, President Trump must resign or be impeached,” said House Democrat Joaquin Castro. While the Democrats were calling for hearings and impeachment, the mainstream media were in full meltdown mode, presenting the BuzzFeed report as a “bombshell” even though no other outlet had been able to verify the information. This madness went on for hours, with pundits relentlessly attacking President Trump on almost every segment of every news channel across America. On this shameful day, the mainstream media and the Democrats managed to get millions of voters to believe in a made-up myth about their President. BuzzFeed’s journalistic malpractice isn’t an isolated instance, either. By any conventional standard, BuzzFeed News shattered its credibility when it first published an uncorroborated intelligence dossier about Donald Trump in 2016 that was paid for by the Clinton campaign. Despite BuzzFeed’s history of publishing unverified information, the mainstream media and the press unquestioningly amplified the publication’s latest fake report — and will likely do so again with poorly-sourced articles in the future to pursue their political agenda of destruction of the Trump presidency. To make matters worse, BuzzFeed has refused to retract its discredited story about Cohen, arguing that its reporting is accurate even though Mueller’s office insisted otherwise. Their most recent humiliation apparently hasn’t shamed the mainstream media, but it should serve as a sobering reminder that they value partisan attacks on the President more than their responsibility to report the truth.